Three decades after it was inducted into the Russian Air Force, the Sukhoi-27 remains the ultimate jet fighter with its super-maneuverability, grace, beauty and sheer power. In 1984, after seven years of development and test flights, the Sukhoi-27 (codenamed Flanker by NATO) was inducted into the Soviet Air Force and the Soviet Air Defence Force. 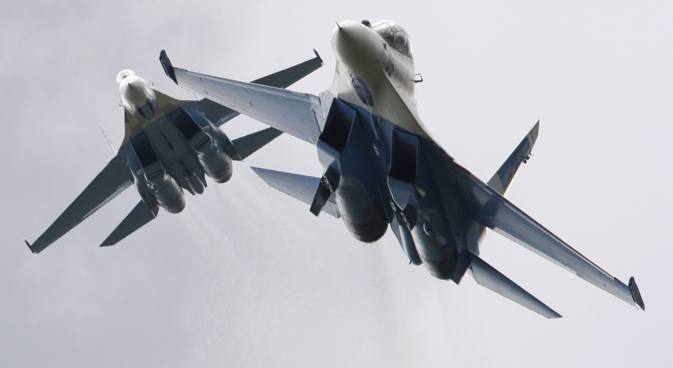 It was a defining moment in the history of combat aviation as the Su-27 – and its later iterations – became the jet fighter that would shift air superiority decisively away from western air forces. When the Su-27 was being designed in the 1970s, the aim was to make it better than any jet fighter the Americans had in their inventory or on the drawing boards – the F-14, F-15, F-16 and the F-18. But when the first prototype flew on May 20, 1977 Sukhoi’s legendary aircraft designer Mikhail Simonov realised it wasn’t as good as the F-15. At great risk to his career, Simonov mustered the courage to go to the minister of aircraft industry, Ivan Silayev, to tell him the aircraft wasn’t up to scratch and needed more work. Silayev said: “It is a good thing today is not 1937,” implying that had it been Stalin’s Russia, Simonov would have been packed off to the gulag. By the early eighties, the Russians had developed an aircraft that exceeded the capabilities of the F-15 – but only marginally. This wasn’t enough for Simonov. He didn’t want Russian fighter pilots to be in a dogfight where their opponents had an equal chance of winning. Russian pilots had to have overwhelming superiority. The end result was a fighter of unparalleled performance. During one of its early flights when the Su-27 was chasing down the F-15’s world records, the fighter had to start at full power from a dead stop. To achieve this Su-27 was tied to a tank with a cable. To the astonishment of the observers the aircraft started pulling the tank down the runway. The test crew had to then tie the tank to a bulldozer. Super-manoeuvrability is the defining characteristic of the Flanker. Aviation expert Bill Sweetman explains how this can decide the outcome of an air battle: “Unpredictable flight paths challenge the guidance algorithms of any missile system.” Basically, by making the missile work harder the Su-27 effectively reduces its range. At the same time super-manoeuvrability boosts the Flanker’s own missiles. “Rapid nose-pointing can permit a short-range missile launch with a greater kill probability,” writes Sweetman. One of the little known facts about the Flanker is that its super-manoeuvrability reduces its visibility on radar screens. Simonov explains: “Super-manoeuvrability should be looked at as a system of manoeuvres for close aerial combat. Once the pilot receives a signal that his plane is being tracked by enemy radar, the first thing he needs to do is to go vertical. While gaining altitude and losing speed the aircraft starts to disappear from the screens of radars that use the Doppler effect. While the Flanker’s manoeuvrability is legendary, its long range also comes into play in aerial combat. This allows it to perform repeated probes and U-turns – a Cold War Russian tactic – that can leave its opponent disoriented, exhausted and vulnerable in a dogfight. Another little known aspect of the Su-27 is its spacious cockpit which allows more freedom of movement for the pilot. In fact, in the Su-34 (fighter-bomber version) the cockpit is so massive that the pilot can stand and move about inside during long missions. Test pilot Igor Votintsev’s longest flight lasted 15 hours and 42 minutes. The Su-27 and its subsequent versions such as the Su-30, Su-34 and Su-35 mark a historic shift in air-power from the United States to Russia and the countries that use Russian defence technology. Whether in India, China, Indonesia or Venezuela, the Flankers have degraded the offensive and defensive capabilities of their western and western-backed opponents. 4++ generation Flankers are also making future western aircraft redundant. In July 2008, at the US Air Force’s Hickam airbase in Hawaii, in a simulated dogfight involving an attack by Russia’s Su-35 against a mixed fleet of American F-22 stealth interceptors, F/A-18 Super Hornets and the latest F-35 stealth fighter, the F-35 was “clubbed like baby seals” by the Super Flanker, adding to the beleaguered stealth fighter’s ongoing troubles.